Transform your phone into an in-air mouse, touchpad mouse, a keyboard and more! Use MouseMote to surf the web from the comfort of your couch or use it to make your slideshow presentations more fluid. The most important function of the app is the airmouse feature. 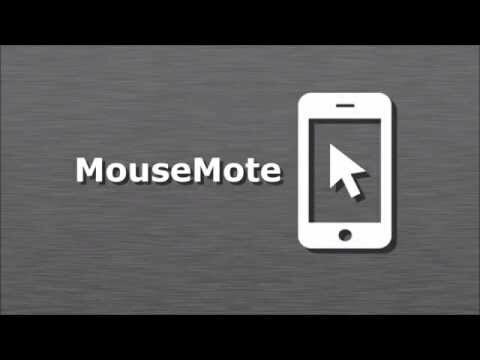 MouseMote allows you to control your computer mouse by moving your phone around the air. It works by using the in-built motion sensors in your android phone to detect the angle at which you hold your phone. The app translates the change in the angle into mouse movements which means you can control your computer mouse by moving your phone around! Try it out to see for yourself! This is the free version of the app. Free version has all mouse functions and some features. Full version has all features and no ads. - Move phone around to control computer pointer. - Buttons for left/right mouse button and scroll button. - The app uses gyroscope for airmouse function. If you are not sure whether your phone has one, you can test the free version of the app to see how the airmouse works on your phone. - Some sensors can be disturbed by magnetic fields, so do not use the app right next to electronic devices or strong magnets. - The app works differently in different phone models, we would ask that you do not give the app a bad rating based on problems with the sensors - there's nothing we can do to help with that except offer configuration advice, sorry. Check out our refund policy. - The quality of the in-air mouse functionality depends hugely on the quality of sensors on your phone model. On some phones the app might not work well despite of our best efforts. - If you would like a refund, please send us an email within two days containing the order number and a brief description of the problem. If we cannot find a solution to your problem, you will be offered a refund. It is difficult to fix problems reported via Store Comments, please use email! If the app does not on your phone work for some reason, please contact us (contact@mousemote.com). We will help you with your problem.